The map shown here is a truly quick-and-dirty visualization of the distribution and density of Waffle House locations as of summer 2012. It started as a way for me to play with 3D in Google Earth, but that giant spike in Atlanta was interesting enough that I thought it worth sharing. 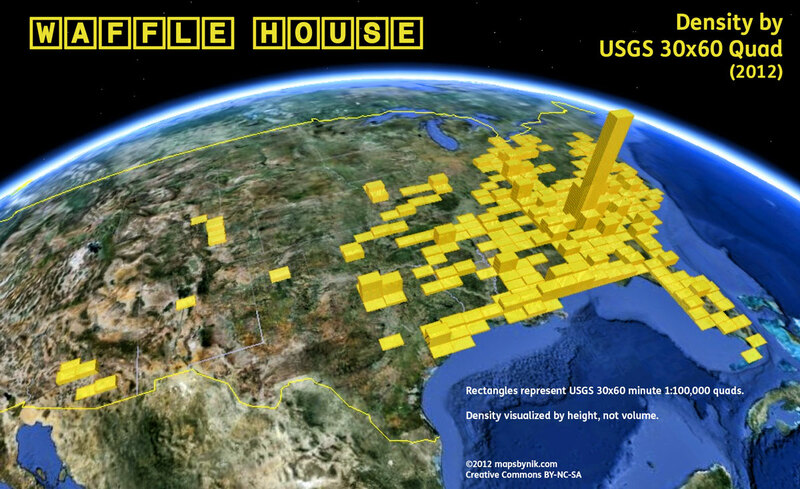 The rectangles represent U.S. Geological Survey (USGS) 30x60 minute (1:100,000) map quad boundaries and the height extrusions are proportional to the number of Waffle House locations found within that quad. Atlanta, Georgia is the clear standout on the map. Its quad contains 132 locations. Immediately north of Atlanta, the Cartersville, Georgia quad is next highest on the list with 45 locations. 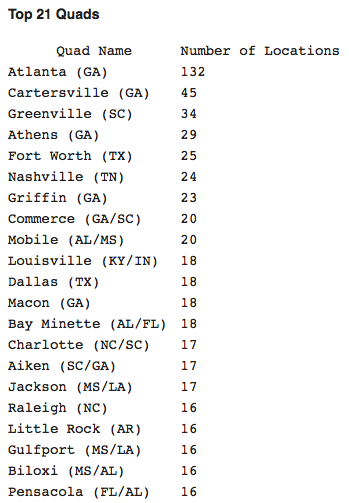 These are followed by Greenville, SC (34), Athens, GA (29) and Fort Worth, TX (25). The Atlanta metro area's dominance on the map is not unexpected, though its scale is somewhat surprising. The first Waffle House restaurant opened in the Avondale Estates, an inner Atlanta suburb, in 1955 and the company is headquartered in Norcross, another nearby suburb. Waffle House has a reputation for omnipresence in the South and that seems especially true in the Atlanta area. The Atlanta quad has nearly three times the number of restaurants as the next highest. And that next highest quad, Cartersville, actually contains most of the north Atlanta metro area. Atlanta is home to a full eleven percent of WaHo locations. Beyond Atlanta, the map shows that Waffle House is indeed primarily a Southern phenomenon with a few surprising and unusual patterns in a couple metro areas. Phoenix and Denver have a handful of locations, but there are none in California. Amarillo has five locations, but San Antonio has zero despite being a much larger city at the junction of two major interstates. This visualization stems from my irrational, lifelong infatuation with Waffle House, the always-open dive joint that manages to provide a low-cost, consistently-satisfying breakfast meal at its 1,600+ locations. It's one product of a casual analysis I started a few years ago to find WaHo locations that were unexpectedly close to each other, and it snowballed into a bunch of different depictions of Waffle House geography. I recently stumbled on these old files and will (eventually) be sharing them as I get them cleaned up and presentable. The area of each quad is the same, so comparisons among them are equitable. Actually, this isn't true. My software lied to me. In fact, due to converging meridians, quads cover smaller areas in the north. The difference, fortunately, does not affect the results of the analysis. The quads are continuous across the entire USA. There are no gaps, so every Waffle House location falls within one quad. Quad boundaries are static. They will not have changed if I update the data. Quads are named for the area they cover, making it easy to discuss particular locations. At approximately 2,392 square miles each, quads are a nice "bucket" size for tabulating this kind of location data meaningfully. Restaurant addresses were taken from wafflehouse.com and geocoded with services from both Google and MapQuest. Discrepancies were rectified by hand. As a set, the locations are generally accurate but no given restaurant is guaranteed to be correct.